The opera Viva la Mamma is an outstanding opera production with the Wagner Society and Lara Bye as the innovative director. 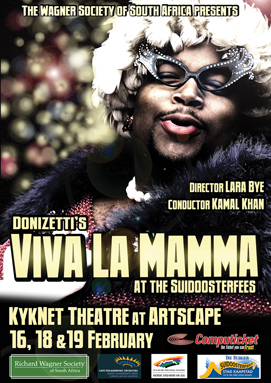 “The 2012 production, Viva la Mamma, was an African premiere of Donizetti’s opera. “Once again she stretched the comical to the point where people almost laughed non-stop, creating an irresistible festival experience for both opera virgins and connoisseurs, “ he said.